This summer, throughout the West, higher temperatures and decreased precipitation brought on by climate change have ramped up the frequency of wildfires -- big, catastrophic fires -- while a century of fire suppression feeds the flames with a thick tangle of fuel in our overgrown forests. We can't stop all fires -- and we shouldn't. Healthy ecosystems depend on them. But understanding what drives big fires and predicting their behavior helps the fire community prepare for the next blaze through appropriate land management, emergency plans and firefighting strategies. Beyond those benefits, a deeper understanding of wildfires prompts important insights into tactics for using prescribed fire as well as insight into larger regional environmental issues, including how fires change river flows and the availability of water for drinking, agriculture and energy production. 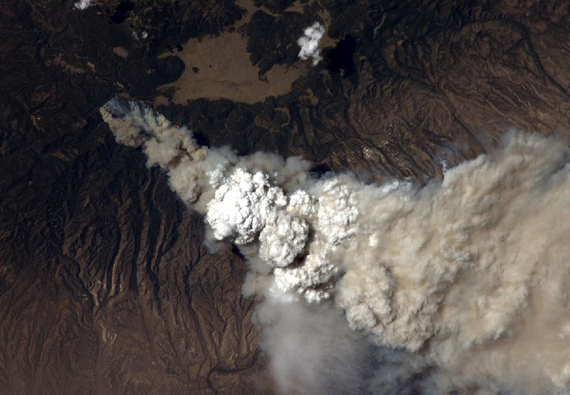 For scientists studying wildfire, the challenge is predicting the seemingly unpredictable. A wide range of conditions -- temperature, humidity, wind speed, wind direction, larger weather patterns, available fuel, fuel conditions and terrain --influence the behavior of fire. Figuring out details such as the movement of hot gasses coming off a raging forest fire or the combination of convective and radiative heat transfer that ignite unburned fuels, for example, seems impossible at first. There's so much to consider, from how the fire front interacts with the atmosphere that drives it forward to the feedbacks of the fuel's structure on the fire and winds to the impacts of the topography and regional meteorology. Fortunately, Los Alamos National Laboratory is well suited to address this kind of multidisciplinary, ultimately physics-based problem -- and the lab has a stake in wildfire prediction and management. As the Cerro Grande and Las Conchas fires demonstrated, the laboratory and neighboring communities are equally vulnerable to runaway conflagrations on our doorstep. Furthermore, Los Alamos' mission includes addressing energy security and national security, both of which can be affected by wildfires. Modeling wildfires exploits the lab's unique capabilities in physics, computational modeling and high-performance computing. For decades the lab has built computer models of complex systems that move and change through time. That work includes hot gasses -- fire -- and the atmosphere. The laboratory's supercomputers make it possible. When a team of atmospheric scientists, computational physicists and mathematicians in the laboratory's Earth and Environmental Sciences division, collaborating with the U.S. Forest Service Rocky Mountain Research Station and Southern Research Station, set out to simulate the interacting processes that make up a wildfire as a basis for predicting its behavior, they leveraged a wealth of expertise and experience that had been developed partially through the laboratory's weapons program. A research effort initiated by Laboratory Fellow Francis Harlow, a pioneer in computational fluid dynamics, and Andrew White, a visionary figure in the national high-performance computing community, led to the development of FIRETEC. It was the first wildfire model to simulate the interaction among many of the physical processes that determine the continuously shifting dance between fire and its surroundings. FIRETEC, which is now developed in collaboration with U.S. Forest Service, simulates three-dimensional interactions among fire, fuel and the environment at landscape scales. By coupling FIRETEC with an atmospheric-dynamics model called HIGRAD and using real-world data, the team can represent the interaction between fire and atmosphere and the way fire adjusts to terrain, vegetation, fuel and the dynamics of fire itself. FIRETEC presents a new way of studying fire and learning how to better manage and cope with it. The model provides additional scientific input for decisions by policymakers working in land management, water resources and energy. The team hopes it will eventually assist fire and fuel management operations. Currently the team is partnering with the Rocky Mountain Research Station to study the combined influence of wind and slope on heat exposure in firefighter safety zones, with the Air Force Wildland Fire Center to study the efficiency of various prescribed fire tactics and with INRA of France and the Canadian Forest Service to study the effects of fuel breaks for fire management. But there's more research to be done to further improve wildfire modeling for practical use in the field during a fire. FIRETEC's complexity and the massive amounts of data involved require enormous high-performance computers such as those available at Los Alamos to perform simulations. The laboratory-led team is now working with the Forest Service to apply what it learns from FIRETEC to assist in developing and refining less detailed but faster-running tools that incident fire commanders could run on their laptops to predict fire behavior over the next few hours. This is a short enough time frame to deploy firefighters in anticipation of the fire's next move or help keep firefighters out of harm's way. This faster-running tool could also benefit decision-support tools such as Simtable, which is currently used in the laboratory's Emergency Operations Center. On another front, as part of a larger Los Alamos study on the impact of climate-driven changes on watersheds, laboratory researchers are working toward using FIRETEC to potentially spin off simplified models. One model can explore, for example, how the aftermath of a catastrophic fire in the Colorado River system might alter flows in the San Juan River. That's important locally because the San Juan supplies drinking water to Santa Fe and cools the Four Corners Generating Station, a major regional energy source. How will climate-driven changes to vegetation alter the pattern of fires and the severity of the effects in that watershed? What can be done to minimize those impacts? Research underway now should answer these questions. Providing those answers is an appropriate endeavor for Los Alamos for several reasons. While the Los Alamos community has had more than its fair share of encounters with wildfire, the research is more than personal: it fits the laboratory's mission to enhance energy security and national security. Additionally, the required expertise in the combination of multi-phase fluid dynamics, heat transfer, combustion, computational modeling and computer science are optimally aligned with many of the laboratory's other mission areas. "Science serving society" is a catchy phrase, but in the case of wildfire modeling at Los Alamos, it couldn't be more apt. Rod Linn is a senior scientist in the Computational Earth Science group at Los Alamos National Laboratory, where he studies and models a wide range of atmospheric phenomenon using computational physics. Linn has led much of the development and application of the FIRETEC computer program for predicting wildfire behavior, but the breadth of work using this tool is accomplished through a broad set of Los Alamos investigators as well as domestic and international collaborators.